Tidal Bay has suffered a stress fracture and will not run in the Grand National on 6 April. 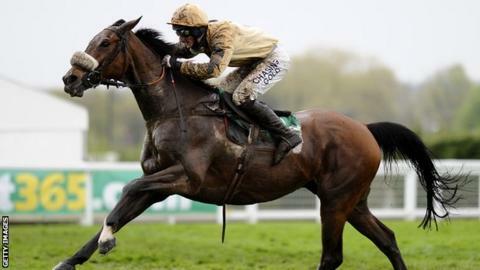 The Paul Nicholls-trained 12-year-old had been allotted top weight of 11st 10lb for Aintree. But he has not run since winning the Lexus Chase at Leopardstown over Christmas and a MRI scan on Wednesday revealed a "tiny stress fracture". "He needs a month's box rest, so that rules out the National," said Nicholls in his blog. "He was out cantering as usual on Monday and Tuesday, but on Wednesday we decided to step up his work. "But his work rider came back up and said he didn't feel right, so we immediately called in Buffy (Shirley-Beavan, equine vets) and, after discussions, we got him down to Newmarket for an MRI scan. "The news through from Buffy is that Tidal Bay has a tiny stress fracture of the lower cannon bone on his right hind leg." With Tidal Bay ruled out, the weights for the National will rise at least 2lb, with Albertas Run the new top-weight. Tidal Bay owner Graham Wylie added: "He's out for the season, I'm afraid. "We need to do our best for the horse's welfare and he'll have plenty of box rest before we can hopefully get him back next season." Wylie still has two strong National contenders in the Willie Mullins-trained pair of On His Own and Prince De Beauchene. Nicholls, meanwhile, has three strong chances in Becher Chase runner-up Join Together (10st 12lb), and a pair part-owned by Sir Alex Ferguson in What A Friend (11st 5lb) and Harry The Viking (10st 2lb).